Crimson Trace has announced the release of the innovative new Lasersaddle™ LS-250 red laser sight (and LS-250G green laser sight) for the Mossberg Shockwave firearm. The simple-to-install Lasersaddle LS-250/G laser sight secures onto the firearm’s receiver side and upper area and operates with three distinct activation points, including one that can be accessed by left-handed users. The batteries for operation can also be easily changed with a rapid-change battery cap on the sight’s exterior and without the laser sight being removed from the firearm. The Lasersaddle LS-250/G laser sight is also designed to permit installation of an accessory rail on top of the firearm after the laser sight is installed, has a master on-off switch, and incorporates integrated battery management technology for enhanced battery life protection. 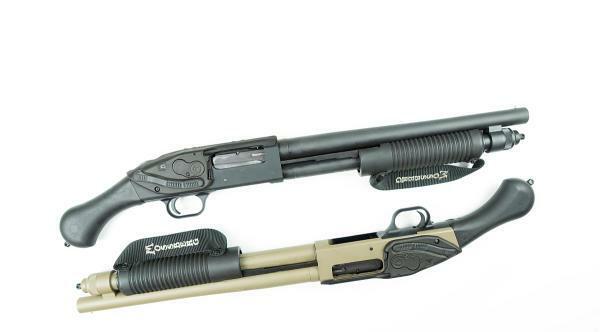 The Crimson Trace Lasersaddle LS-250 (red) and LS-250G (green) laser sights will also fit onto most 12-gauge Mossberg 590 and 500 shotguns. The LS-250 laser sight is covered under Crimson Trace’s Free Batteries for Life program and the company’s 3-year limited warranty. This laser sight is available nationwide and is packaged in the new distinctive CT packaging. The Manufacturer Suggested Retail Price is $169 for the red Lasersaddle LS-250 and $219 for the green Lasersaddle LS-250G laser sight.